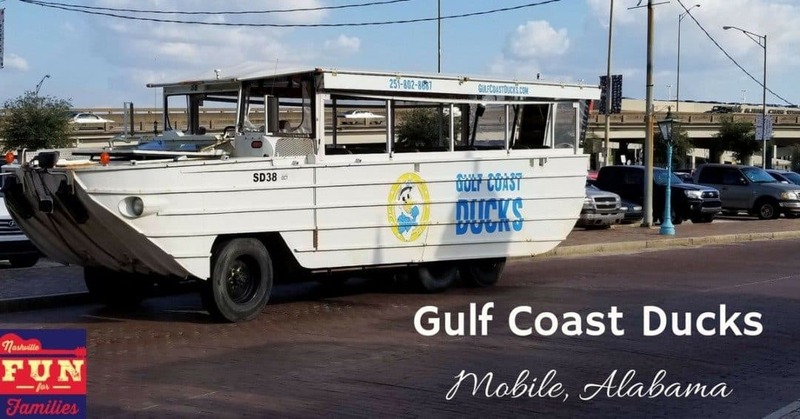 Plan a unique tour of Mobile, Alabama with Gulf Coast Ducks. Ducks are amphibious vehicles that were used by the American military in World War II and the Korean War. The original Ducks were built by women during the “Rosie the Riveter” part of American History. Luckily for us, those women built the ducks to last because one of them built in 1945 is now used to tour land and sea in Mobile. The Ducks are comfortable to ride in and are equipped with all the necessary safety equipment. The tour begins in downtown Mobile. Our tour guide gave us lots of great information about the history of the city as we traveled through the downtown streets. Each Duck has a driver and a guide so no worries about either of them being too distracted to do their job. Along with the historical facts, our guide also gave us lots of good tips on where the locals eat and play in addition to plenty of jokes along the way. Gulf Coast Ducks splash into the Mobile River for the second part of the tour. Don’t worry. The guide will give you plenty of warning when your tour is moving from land to water. We got splashed a tiny bit during the transition but nothing that would necessitate a change of clothes. The duck travels pretty slow on the water so you you shouldn’t have any problems with seasickness plus you get lots of time to view the beautiful river. The Duck transitions to dry land again at Battleship Memorial Park and then back into the water for an up close view of the USS Alabama. You aren’t going to get this view from any other tour. You might even get a chance to pilot the Duck during this part of the tour! After the tour of Battleship Park, the Duck will splash down in the Mobile River one more time to before the tour ends back on dry land in Downtown Mobile. This is a perfect tour for families. If your kids would be bored to tears by a traditional tour, you have no such concerns with the Duck. I took my 14 and 16 year old. They were completely unenthusiastic about this tour. But 15 minutes in,they were laughing and talking to the tour guide and they both said it was one of their favorite parts of our trip to Mobile. Thanks to Visit Mobile for sponsoring our experience in Mobile. Their financial partnership keeps our site FREE for our readers. All opinions are my own. Tickets can be purchased online at this link.